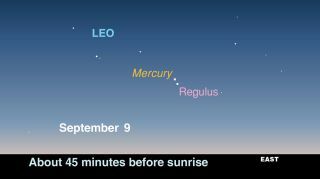 This sky map released by the skywatching publication StarDate magazine shows where to look to see planet Mercury and the bright star Regulus in the pre-dawn sky between Sept. 8 and 11 in 2011. If there ever was a planet that has gotten a bad rap for its inability to be readily observed it would have to be Mercury, known in some circles as the "elusive planet." "… is hardly ever visible when it is truly dark. Mercury … will be seen only near the horizon in dawn or twilight, amid haze and sun glare. I suspect, in fact, that many people today (when the horizon is dirtier and the sky much hazier with the glare of artificial light than it was in centuries past) have never seen Mercury." Nonetheless, during this week we will be presented with an excellent opportunity to view Mercury in the early morning dawn sky. Mercury is called an "inferior planet" because its orbit is nearer to the sun than the Earth's. Therefore, it always appears from our vantage point (as Asimov indicated) to be in the same general direction as the sun. The sky map of Mercury and the bright star Regulus, provided by the skywatching publication StarDate magazine, shows where the planet will appear together on Friday (Sept. 8) before sunrise. In old Roman legends, Mercury was the swift-footed messenger of the gods. While Mercury's average distance from the sun is only 36 million miles (58 million km), Mercury experiences by far the greatest range of temperatures: nearly 900 degrees Fahrenheit (482 Celsius) on its day side, minus 300 F (minus 184 C) on its night side. Mercury is currently rising before the sun this week and is surprisingly easy to see from now through Sept. 15. All you have to do is just look low above the eastern horizon during morning twilight, from about 30 to 45 minutes before sunrise for a bright yellowish-orange "star." Mercury was at its greatest elongation, 18 degrees to the west of the sun, on Sept. 3. The planet, like Venus, appears to go through phases like the moon. On the date of its greatest elongation, Mercury appeared roughly half-illuminated and the amount of its surface illuminated by the sun has continued to increase with each passing day. So although it has now been progressing closer to the sun's vicinity, it will continue to brighten steadily, which should help keep it in relatively easy view over the upcoming week. As a bonus, early on Friday morning, Mercury will have a rather close conjunction with the bright bluish 1st-magnitude star, Regulus, in the constellation of Leo. Look for them, coming up almost side by side, low near the east-northeast horizon about 45 minutes before sunrise. Mercury and Regulus will be separated by three-quarters of a degree. For comparison, the apparent width of the moon is 1/2 of a degree, while your fist held at arm's length covers a 10-degree patch of the night sky. Mercury will be to the left of Regulus and will shine about eight times brighter than the star. Binoculars will make it easier to sight Regulus. Mercury will then pull rapidly away to the east on successive mornings. By Sept. 15 it will have brightened substantially, surpassing the brilliance of every star in the sky with the exception of Sirius (the brightest of all stars). But by then it will be rising barely an hour before the sun and despite its great brilliance, will likely be swallowed up by the dawn twilight glow in the mornings that follow.